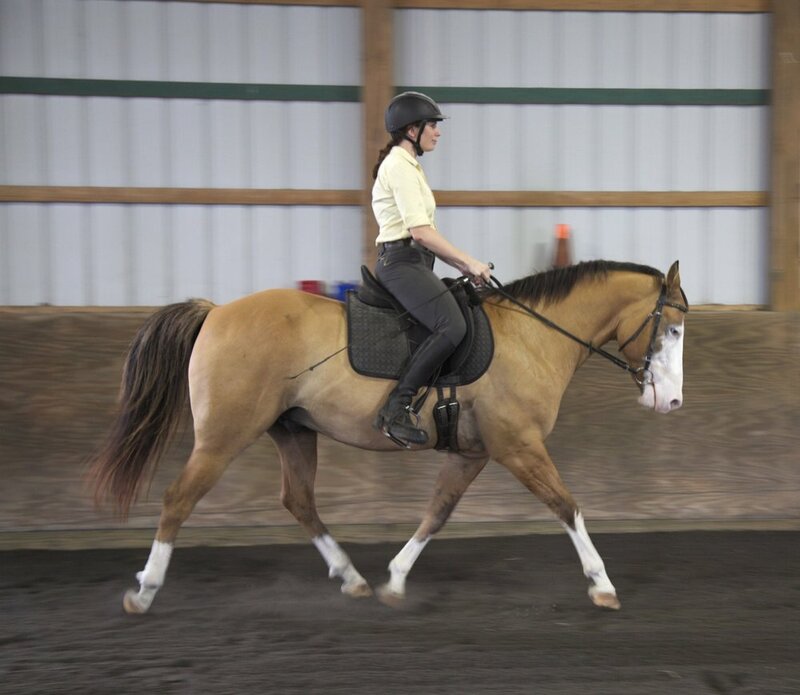 I have been riding since the age of 7, beginning with lunge lessons during summers visiting my grandmother in Connecticut. Once back home in Northern VA, I begged for lessons and rode at Tamarack Stables in Lorton, VA until high school. I attended Wilson College in Chambersburg PA, graduating in 2000 with one major in Equine Facilitated Therapy and another in Equine Management: Teaching Track. I spent almost the whole of 2002 in England, studying with Mary Wanless, internationally renowned biomechanics expert and author of many books about the biomechanics of good riding. I then worked with Francie Dougherty of Seneca Sport Horses in Poolesville, MD for three years before coming to Great Strides, in Damascus MD to serve as Barn Manager and Instructor. I started at Great Strides in April of 2005 and still manage and teach at the farm to this day. I also organize two Mary Wanless clinics per year, held at Great Strides, and do my own clinics at local barns in the Greater DC area. I achieved Competence of the first level of Mary Wanless's Coach Accreditation in 2012 and am in the process of completing the necessary work to achieve Mastery of it in 2018. I have been attending RWYM Teacher Trainings every year or two for the last 15 years, and have organized and hosted Teacher Trainings as well. I am constantly studying, learning, re-learning and refining my understanding of what makes a rider improve. I periodically will pick up a new hobby or skill so that I can remember what it's like to be a beginner again, learning something new and feeling what it's like to not know the answer. This is the place a lot of my students are coming from, and I respect that they put their trust in me. In 2015 I was certified as a TAGteach Level 1 Instructor. What is TAGteach™? A revolutionary new way of teaching, it’s a tag point. The tag point is the specific learning goal that the teacher will mark with a tag that highlights success for the learner. The tag pinpoints the exact moment the tag point is executed correctly and gives immediate and clear feedback to the learner or athlete. The most common and effective way to mark a correct response is with a short sharp sound made using a handheld clicker or tagger. TAGteach is a targeted organized approach to giving positive reinforcement that facilitates accelerated learning while minimizing frustration on the part of teacher and learner.